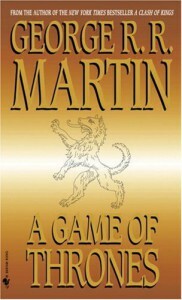 A Game of Thrones - Becca's Book Bonanza! This book had some major ups and downs for me. But mostly ups :) The author did a really great job with character development, painting all these different characters and giving them interesting stories. The stuff I could do without is the insane descriptiveness for a lot of details that don't further the story line (food, clothing, family lines, etc). I would get lost a lot of times during the descriptions cause they were just so verbose. I love how he plots each character's story in a certain direction, getting you excited for this certain direction and then BAM something huge happens that you never expected and all of that prep is out the window and you have no idea what to expect any more. It's refreshing after years of reading authors where they have formulas of wrapping everything up in a tight little bow and you can pretty much figure out how things are going to happen once you figure out the formula. It's exciting to read a book where nothing is sacred, people who you trust to be the "main characters" and never die will die anyways! I have no clue what to expect for the future of these books but I'm sure I'll keep getting surprised.